We are the foremost Manufacturer, Supplier, Exporter of Qualitative range of Three core Flat cables for pumping motors that is manufactured keeping in mind the usage and protection shield in severe, tough, difficult situation in which they can operate. With rich experience and knowledge we bring forward for our client new kind of Submersible cables for multiple usage, also as per the protection from electrical concern. This shielded copper wire is manufactured from pure bare copper conductor also low resistance conductor. The inner cores are insulated with a special grade pvc compound formulated and manufactured internal. The strong robust outer pvc jacket protects it from the oils, greases, various chemicals and abrasions, thereby giving long life and electrical safety. Our skilled professional manufacture it using their excellence, skill they convert them into usable, protective cables. The PVC insulated and sheathed Three core Flat cables is for making electrical connection to the submersible pump motors. The slot accessible in the tube well being narrow the shape of the cables has to be suited for specific application. 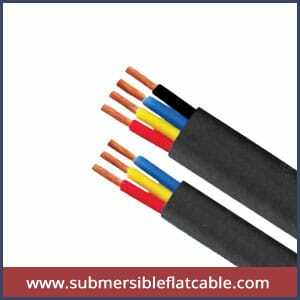 The available Three Core Flat cables submersible copper cables high efficiency , durable, long lasting , Non-corrosive, High tensile, high volatge tolerance, which offers energy to submersible motors and pumps and has the three cores laid up in flat equivalent position. Made in accordance with the present industry standards these cables are provided in different specifications to fulfill the varied needs of our esteemed clients. The outer layer of cable is kind of protection against water, abrasion, grease, oil, resistance, also in severe condition protection from water as it is used in submersible pump for and against ingress of small solid alien bodies.